Discover our Selection of Antique Quartz Rings, Estate Quartz Rings, Vintage Quartz Rings and Modern Quartz Rings. For a Custom Quartz Ring Design Click Here. 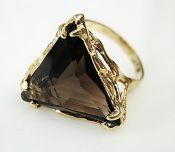 A stunning vintage 14kt stylized yellow gold ring featuring 1 trilliant cut dark brown smoky quartz, est. 25.14ct. 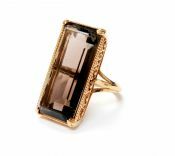 A beautiful vintage 10kt yellow gold ring with 1 emerald cut dark brown smoky quartz, est. 30.05ct. For those that sew, a custom made 18kt yellow gold ring with 2 bezel-set round facetted cut foil back glass (paste). 10kt yellow gold ring with claw-set, oval cabochon banded quartz solitaire, approz 20.47ct. One custom-made 14 karat yellow gold ring. One cut quartz (15.93 carats). Trademark: Elis Kauppi, 1966 (a prominent designer from Finland). One 14 karat white gold ring. One smoky quartz (1.50 carats). Two round brilliant cut diamonds (0.05 carats: SI clarity: G-H colour). One 18 karat yellow gold ring. One fancy shaped rock quartz. Twenty-two square cut blue sapphires (0.98 carats). One 10 karat yellow gold ring. 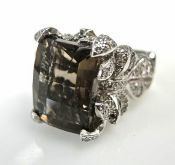 One smoky quartz (7.14 carats).